The goal of project CANOPUS is to cut the cost of access to the mesosphere and to space for small payloads. We have just completed the design of the the concept of operations and feasibility study phase of CANOPUS and the simulation above is the result of this study. The fundamental idea is to elevate the ‘launch pad’ of a small, low cost rocket (atop which sits a 1-3kg payload) into the upper troposphere, thus ‘bypassing’ the dense lower layers of the atmosphere, wherein most of the fuel of a conventional rocket would be burnt. Our simulations have shown that even a small, two-stage, solid-fuelled rocket would be able to lift a CubeSat scale payload over the Kármán line for a suborbital flight with an apogee of up to 150km. A very cheap way of elevating the launch platform to the required altitude is via a high performance optionally piloted glider – it requires no special ground infrastructure and it can be deployed at very short notice. With the feasibility study complete, the next stage of project CANOPUS is the development of a full scale demonstrator. It has been some time since we last posted an update on here, but we have been very busy behind the scenes. ASTRA is developing the Massive Atmospheric Volume Instrumentation System (MAVIS). This is an unmanned air system consisting of a large number of very low cost, bio-degradable flying sensors, which can be released en masse from a high altitude balloon in order to map the physical variables of a target block of airspace. 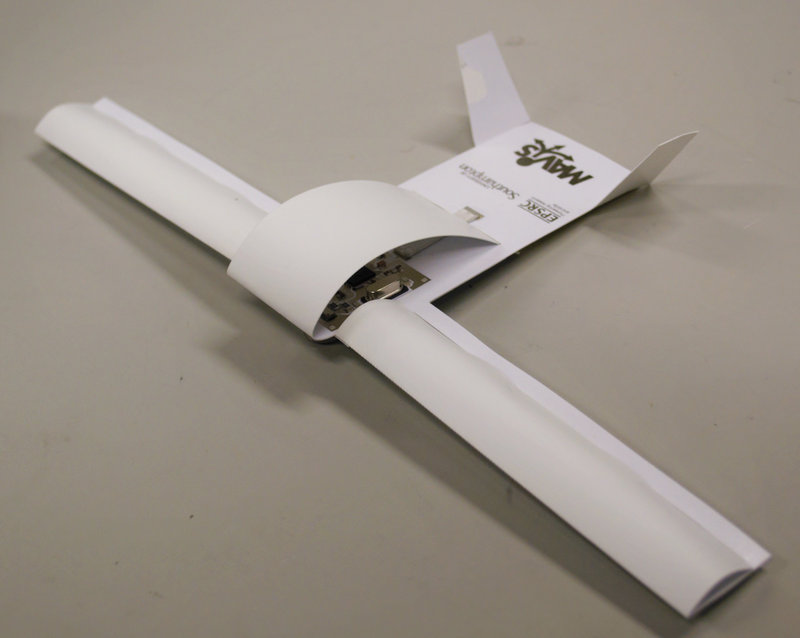 Agnes (see the image to the right) is the first iteration of the MAVIS sensorcraft – a paper airplane with its avionics printed in silver ink onto the ‘airframe’ itself. We took Agnes to the AIAA SciTech 2015 conference – the conference paper (King, Sóbester and Scanlan) contains an in-depth look at Agnes’s development. Progress is being made on the software side too, with developments on the path planning front. The goal of this activity is to understand how should this fleet of sensorcraft descend to maximize sampling efficiency. Another SciTech 2015 paper (Crispin and Sóbester) summarizes progress in this area too. How do you launch a high altitude radiosonde from a remote location without on-site personnel? As part of the ASTRA initiative, 4th year MEng Aeronautical Engineering students from the University of Southampton designed a lightweight, compact and portable radiosonde launcher, which can be deposited at a remote site, to be triggered via a text message when a sounding is required. Applications include observing transient phenomena (e.g., via triggering the launch remotely when convective activity is observed at any of the sites where automated launchers had been placed) or sending very large amounts of data (on hard drives) back via a high altitude balloon borne pod from inaccessible locations (e.g., marine buoys, underwater vehicles surfacing to perform a data ‘upload’ via balloon launch). The video shows the test flight of the prototype – the balloon inflation takes about five minutes, with the actual release at 5:40. Although the goal of ASTRA is to create autonomous vehicles, during the development process it is sometimes useful to take direct control over the aircraft. 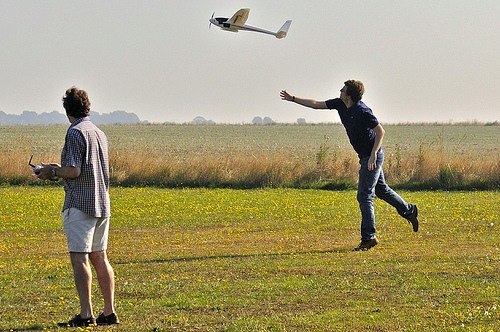 Manually remote controlled aircraft can also be used as launch platforms for smaller autonomous vehicles. The flight of remote control aircraft requires precise hand-to-eye coordination, a keen sense of spatial awareness and intense concentration. ASTRA researchers Philip King and Chris Paulson occasionally showed some of these qualities during their day of training last month at the Paul Heckles Fight Centre, near Swindon, UK. The first flight of the new ASTRA avionics testbed took place today. The sub-1kg electrically powered unmanned air vehicle is based on an off-the-shelf airframe and it is fitted with a reconfigurable, 3d-printed payload bay. The goal of this platform is to serve as a testbed for autopilots, sensors and other devices to be flown on other ASTRA aircraft during their development phase. A novel unmanned aircraft system designed for oceanographic research, developed by 4th engineering students at the University of Southampton, has had its maiden flight near Oban, in Scotland. 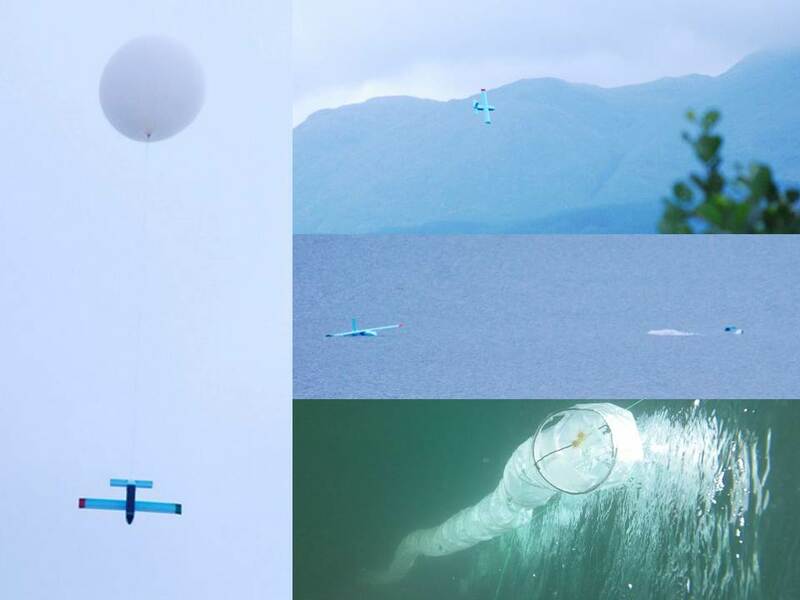 Commissioned by ASTRA partners, the Scottish Association for Marine Science, the system comprises a glider (launched from a high altitude balloon), which is capable of delivering a small, compact and low cost ocean drifter (also developed as part of the ASTRA initiative) to a specific location on the ocean surface. A few meters above the water the aircraft is designed to disintegrate, jettisoning the instrumented drifter and its long underwater drogue. The image above shows the various stages of the operating concept (clockwise from left): glider launch via helium balloon, glider flight to target location, glider disintegration and drifter+drogue separation on the ocean surface and drogue slowly sinking upon impact with the water. The key application of the system is to chart ocean currents. The ASTRA initiative and the 4th year students (who, incidentally, graduated today!) involved would like to thank the Scottish Association for Marine Science in general and Dr Phil Anderson in particular for their generous hosting of the flight test phase of the project. We are preparing to launch a brand new project as part of the ASTRA initiative. MAVIS (Massive Atmospheric Volume Instrumentation System), funded by the Engineering and Physical Sciences Research Council (grant no. EP/K035037/1) will develop a new atmospheric sensing system based on the following concept: a fleet of small, very light, instrumented gliders are released en masse from a high altitude meteorological balloon over the environment to be observed. 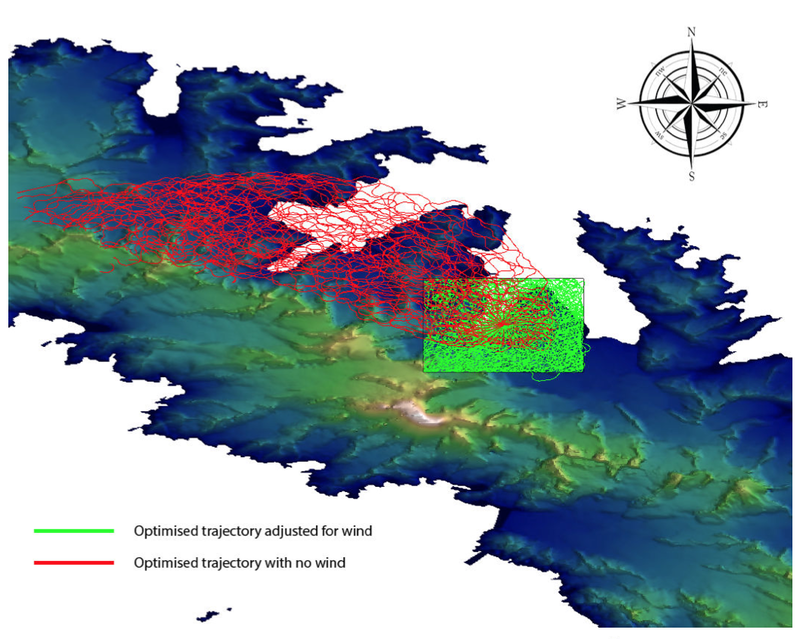 During their autopilot-guided descent along paths optimized for sampling efficiency, they collect a dense set of readings, which can subsequently be converted into an accurate map of the quantity being observed. Building on existing balloon-launched sensorcraft developed as part of ASTRA, MAVIS will take the concept to becoming a system ready to be deployed on large scale science missions. In collaboration with our colleagues at SAMS, as well as with our project partners (the MetOffice, NCAS, and the British Antarctic Survey) we will design, build and demonstrate a system capable of mapping atmospheric variables across a broad altitude range and at a relatively low cost. To achieve this, we will be offering a job opportunity to a Research Fellow on a three year fixed term contract, starting in the autumn. More details and a formal advert soon – meanwhile, if interested, please send informal inquiries to Dr Andras Sobester (first initial dot surname at soton.ac.uk).